American-Filipino Andray Blatche (211-F/C-86) had a very impressive game in the last round for Xinjiang FT and that's him to receive a Asia-basket.com Player of the Week award for round 25. The 28-year old power forward had a double-double of 39 points and twenty rebounds, while his team beat TianJin S. (#13, 9-16) 102-96. Xinjiang FT maintains the 7th position in Chinese CBA. They would have been even better if they hadn't lost a few games earlier this season. Xinjiang FT will need more victories to improve their 17-8 record. In the team's last game Blatche had a remarkable 60.0% from 2-point range. He turned to be Xinjiang FT's top player in his first season with the team. Blatche has impressive league stats. He is in league's top in points (8th best: 29.4ppg) and averages solid 2.8spg and 60.2% FGP. The second most remarkable performance in last round's games was 25-year old American forward Michael Beasley (208-F-89) of Shanghai S.. Beasley impressed basketball fans with a double-double of 44 points and 16 rebounds. Bad luck as Shanghai S. lost that game 99-116 to the higher-ranked Liaoning H. (#1, 24-2). Shanghai S. managed to keep the same 12th spot in the standings. His team is not often considered as one of the league's best with a mere 12-13 record. Beasley is a newcomer at Shanghai S. and it seems he did not have too much trouble to become one of team's leaders. He belongs to the best scorers in the league with 29.2ppg (#9). His other stats are also decent: 10.5rpg and 4.7apg. The third best performed player last round was American Arnett Moultrie (208-F/C-90, agency: David Lee services) of Jiangsu Dragons (#14). Moultrie got into 30-points club by scoring 32 points in the last round. 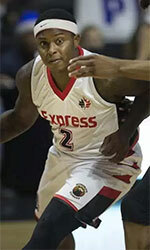 He went also for seventeen rebounds and four assists. 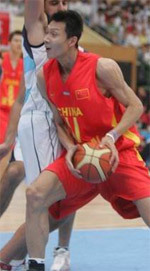 He was a key player of Jiangsu Dragons, leading his team to a 125-119 win against the lower-ranked Chongqing FD (#20, 3-22). The chances of Jiangsu Dragons not to end season at such low position in the league, however are less than slim as they have already lost 16 games, recording just nine victories. With bigger assistance of his teammates, Moultrie could try to bring Jiangsu Dragons' a little bit higher in the standings. Moultrie has a very solid season. In 5 games in China he scored 26.0ppg.